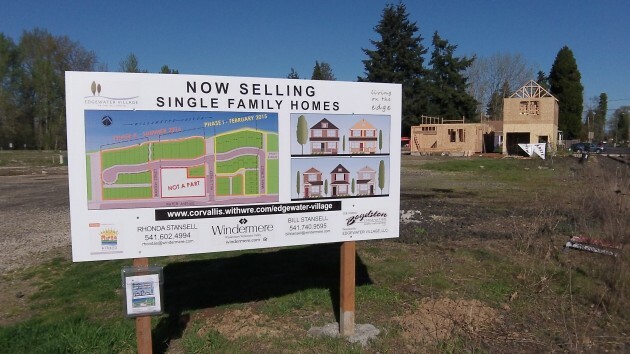 The signboard tells potential buyers what it’s all about and whom to call. 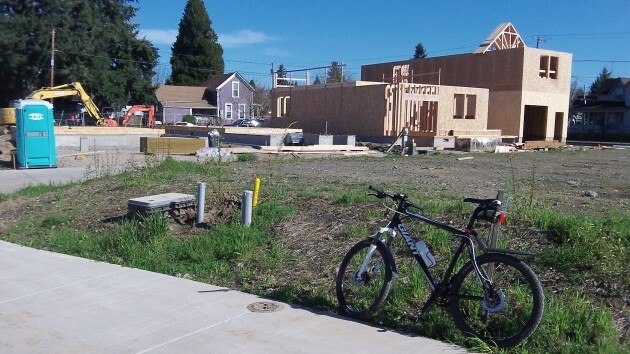 It’s encouraging to see the first houses going up in Edgewater Village, the planned development sandwiched between Albany’s Water Avenue and the Willamette River. It signals the continuing transformation of an old part of Albany that had been a wasteland for some time even before the former packing plant on this site burned in 2006. When I first moved to Albany in the 1970s, the plant packed corn and beans, if memory serves. Then it closed, was restarted by a company from Tennessee and shut down again in short order. Eventually it was converted to freezing seafood, which smelled bad but had the socially redeeming value of providing employment. That business folded too, and the plant sat idle and empty for a while until it burned it down. The ruins sat there for a while longer until the city eventually recruited a potential developer and paid to have the site cleaned up, which meant crushing the concrete and piling the rubble up in impressive peaks. Riding by on my bike, I used to see kids climb those hills and slide down again, so the place had at least some use. The area is already more lively than it was. Across Water Avenue from Edgewater, the Calapooia brewery and restaurant brings in flocks of diners for lunch, dinner and special events. A short walk to the west, Deluxe Brewing is doing the same. Having more residents nearby should help those businesses, I would think, and perhaps encourage others to start up. A long time coming, but well worth the wait! So why don’t I feel good about our property taxes going to a private developer to the tune of $40,000 per house? I paid my property tax for other purposes, not to line the pockets of a developer. It is immoral for CARA to skim and spend in this way. This sounds really nice, but these same excuses could be used for any number of projects that would bleed the taxpayers dry. Why don’t you, and those who think as you do, take care of this yourselves and leave the rest of us alone? We have our own priorities. I was told in school that democracy is supposedly wonderful, but in many respects it’s just a way for 51% to control an unwilling 49%. I absolutely believe that I do not benefit from this project in proportion to what I’m paying for it. I don’t live near the downtown area, and I generally don’t patronize the businesses there either. I generally agree with you, but not on this. This is similar to a planned economy. I view this sort of thing as essentially un-American. If the problem is what to do about a blighted property, then the city has leverage through its municipal and development codes. If those codes need to be toughened up for out-of-town slum lords, then that should happen. 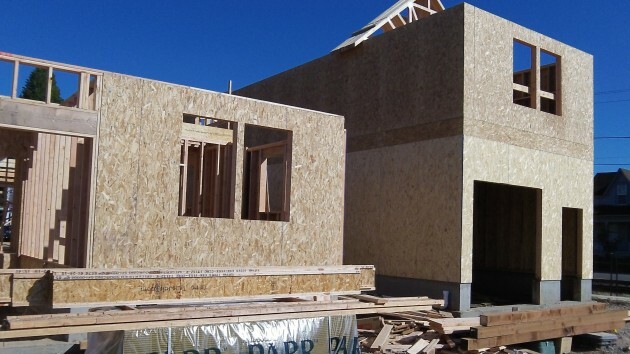 The city does this routinely to coerce property owners who allow their land/buildings to become detrimental to the safety, health, or welfare of the community. Will city leaders consider this option? I doubt it. The power to grant or withhold economic rewards is the lifeblood of Albany politics. Exercising this power is infinitely more pleasurable than the messiness of eliminating blight or the mundaneness of enforcing codes. It seems to me that the $40k Gordon refers to equals $40k to the developer, per house. That’s a pretty handsome profit in its own right. I have talked about this with a developer friend of mine in Medford and he said in no uncertain terms (I can’t quote him verbatim as the adjective before “yeah that’s a sweet deal for the developer” is not fit for publication, but he was “emphatic”) and he wishes he could negotiate such a sweet deal in his locale. Now, if that $40k was paid back to CARA, even at zero interest, that would be more palatable to the many who question the wisdom of CARA and “forgivable” loans. See the forest through the trees . Cara provides the financing gaps that ALL these projects needed that would never happen otherwise . I live in this neighborhood and I appreciate the transformation here . This is the reason almost all municipalities have urban renewal districts . Well, I’m quite disappointed. I posted here last evening, and my post was removed. This was my first post here, and my current one is likely to be my last if it is also removed. I used the word “un-American” in connection with “planned economies.” Perhaps this was misinterpreted as being applied to a person or persons. It was not. My main point was that I believe there are better ways to handle the problem under discussion — ways that don’t involve having a majority force a minority to subsidize something that we not only find to be of little value, but that we outright oppose based on principle. Government is out of line when it forces people to act in ways that are against what they believe are their best interests, and it is even more out of line when if forces people to act against their own principles.